Backyard is a gentle reminder that to experience nature, you don’t need to venture much further than out the back door. Set in a city ‘that is like other cities’, this picture book follows a child and dog, as they sit quietly in the backyard observing the creatures that live there. 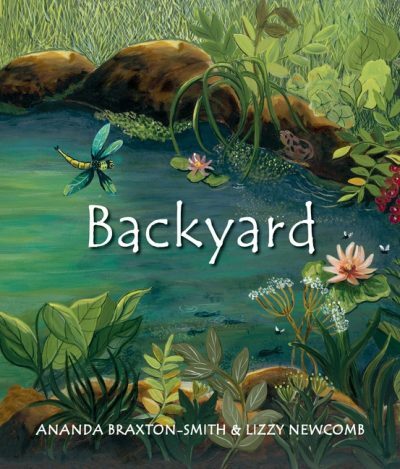 Ananda Braxton-Smith’s words are lyrical and dreamlike; they depict the Australian wildlife vividly—from ‘sweet-tooth’ bats and a ‘circus’ of evening midges to a rude possum scrounging in the dog’s food bowl—reminding young readers that not all animals need to be seen in a zoo or the outback. Lizzy Newcomb’s earthy acrylic paintings complement the text precisely because they are not showy and bright. Instead, they highlight the unassuming beauty of the everyday. Backyard is perfect for sharing with children aged three to eight. Its poetic language and earth-toned art will feel particularly resonant when read on location, be it in a backyard or a local park, and the mix of nonfiction with an appealing narrative will also complement units on native flora and fauna in a classroom setting.